When you get a birdfeeder, you naturally want to hang it up somewhere. If you have a convenient arbor, hooks under your eaves, or an ideally placed and squirrel-free tree, good for you! If not, your thoughts may turn to a shepherd's hook, a metal pole that you can stick in the ground and hang something from. We carry basic shepherd's hooks in multiple sizes, but for better performance and greater customization, consider our Advanced Pole System, a modular system that lets you assemble a pole setup that can accommodate multiple feeders at any height you desire, be placed where you want it, and be easily made squirrel-proof. Why it works better: Rather than the primitive "jam it in the ground" method of most shepherd's hooks, the APS system has a corkscrew auger on the base pole which screws easily into the ground. Then add a four-legged, but low-profile and lawnmower-friendly stabilizer base. Between these two elements, your APS pole will stand straight for many years, even under the weight of several feeders. Heavy duty steel components are powder-coated in attractive black to prevent rusting. Flexibility: The first duty of a pole setup is to get your feeders where you want them. The APS has the standard auger base, patio base, or a variety of deck or fence mounting options. The APS can also be customized to any height you want, with as many hanging arms as you want, and with various other accessory components. Easy Squirrel-Proofing: The addition of a squirrel baffle, as shown to left, prevents squirrels and other creatures from climbing up poles (and without a baffle they will!). Set up your pole system around 10 ft. away from trees or other structures that would allow a squirrel to jump to the pole above the baffle. This will create a squirrel-proof station to give you the maximum flexibility in food and feeder choices. For more on squirrel-proofing, see our Defeating Squirrels page. 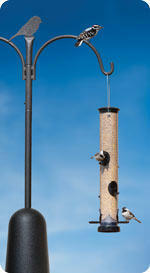 Our Advanced Pole System Basic Setup is an easy way to get your birdfeeding station started. Just twist the 4-foot base pole into the ground using the convenient corkscrew auger. Next slide the Stabilizer onto the base pole and push it to the ground. Add the extension pole, connect the double hanging arm, and top it with the decorative finial; then fill and hang your feeders. All components snap securely together without the use of tools. If you decide you'd like to add additional hanging arms, decorative perching branches, or a squirrel baffle, you can easily do so as needed. To see more examples of possible APS setups and to get an idea of the pieces available, download our digital brochure (pdf format). Remember, all components are available separately and we're always ready to help you assemble a birdfeeding station that meets your needs.